In preparation for this review, I indulged myself in a Sam & Max-athon playing all the previous episodes from Seasons One and Two. It’s a great way to get into this series, but take heart! While it definitely enhanced my enjoyment of Chariots of the Dogs, previous knowledge of this comedic world and its zany denizens is not required. All you absolutely need to know is that Sam is a six foot suit-wearing, bipedal dog and Max is his constant psychopathic rabbity-thing companion. Together they form the Freelance Police and mayhem and facetiousness follow them everywhere. Episode 203 (Night of the Raving Dead) ends with Bosco missing and the Inconvenience Store extremely inconvenient. In fact, it’s padlocked. Chariots (Episode 204) picks up this thread. We see our heroes, Sam, Max, and Flint Paper, breaking into the store in search of Bosco’s bunker. Getting in is easy. Getting out……hmmm, that’s another story. They find the store bathed in eerie red emergency lighting. A series of laser beams spiderweb the bathroom door. The trio form a pact to investigate as only they can. They poke, they prod, they explode things, and the chase is on -- and all this before the opening splash screen. 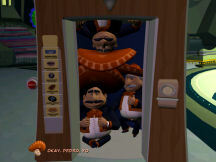 Episode 204 sends Sam and Max traveling through time and space in a quest to rescue Bosco. Along the way, it grants us a peek into our protagonists’ histories. Small as this glimpse is, it aids the gamer in seeing the various characters’ “humanity.” It blends players and props from past episodes while expanding our understanding of who the characters really are. Of course, the plot twisted and turned and seldom did what I expected it to -- except of course, that is what I expected it to do. I’m glad we already know there is one more episode yet to come in this season. Though Chariots ends with a bang, it leaves a few loose ends. Be sure to watch the credits for a bonus cut scene, which may (or may not) answer one of life’s biggest questions. 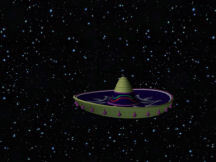 The previous episodes featured memorable characters, and this holds true for Chariots. We meet several new eccentrics as well as many old ones. Several, but not all, of my favorite oddballs are back -- including Flint Paper. His role is small, but his paranoia fits into the Freelance Police’s style of investigation like a precisely engineered set of gears. The fun doesn’t stop there. A player formerly glimpsed only briefly has a prominent role here. Best of all, we meet various incarnations of Sam, Max, and Superball -- and we see Bosco as we’ve never seen him before. Sam, of course, wears his rumpled gray suit, fedora and tie and remains shoeless. Have you ever noticed he has only three toes? Max wears nothing except his toothy grin. Though the models are not highly detailed (as is expected given their cartoon nature) movement is smooth and fluid. They gesture while talking or waiting and some will move around when not engaged in conversation. If not moved for awhile, Sam utters the strangest things. With all these folks involved, you might think there is a fair amount of talking going on, and you’d be right. Sam and Max have a wisecracking comeback for everyone and everything. No one is off limits and no institution is safe from their skewering wit. The dialogue in this series is a large part of why I play these games. It keeps me amused and sometimes I even laugh out loud. I savored each reference to a previous installment and relished the allusions to games and movies. Among others, I noticed traces of Glenn Miller, “Men In Black,” and “Star Trek.” However, for those who don’t enjoy interaction (or are in a hurry), much of each conversation can be skipped without affecting the outcome of the game. Of course, the gamer must decide wisely which lines are necessary and which ones can be safely bypassed by right clicking. Sam and Max manage to insult almost everyone without resorting to salty language. However, be aware that two mild expletives are occasionally heard (five or six times, perhaps). In keeping with the quality of the rest of the game, the voice acting is excellent. Expression and prosody bring life and depth to the characters (even the inanimate ones). The background music molds itself around the action, and contributes to the off-beat mood of the game. Usually I enjoyed the music, but a time or two when I was stuck and going over the same ground repeatedly in an effort to progress, it annoyed me. Ambient sounds contribute much to the feel of the game. For example, each time Sam launches him into the air, Max lands with a thud. We hear the low rumble of engines and the whoosh of elevator doors as they open and shut. Naturally, a bang accompanies the firing of Sam’s “big gun,” and Sam’s footsteps echo off the spaceship’s metal floor. If you are a Freelance Police aficionado, you already know what to expect. For those who haven’t yet taken the plunge, Chariots’ colorfully cartoonish graphics feature 3D characters in a 2D environment. Sam & Max inhabit a world where angles are seldom right ones and the mundane sits alongside the slightly twisted or the very skewed. This is a game rich in sight gags. Thus, the badges displayed in the Oval Office are those of the Weasel Scouts, the rug on the floor features an emblem of the United States which is definitely not politically correct, and this week’s special at Bosco’s is milk, diapers, and hollow points. I appreciate the way memorabilia from previous cases shows up in Sam & Max’s office. Gameplay is nonlinear, so feel free to roam around the seven available locations. Some are new, some you’ve seen before, but you might see them in a new way. Sometimes the background is static, but not always. 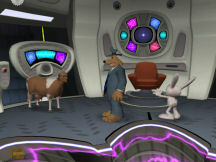 For instance, the fan in Sam & Max’s office turns lazily, but Bosco’s Inconvenience store is devoid of movement. As you make progress, you’ll enjoy several cut scenes. My favorite is a production number which both revealed important information and set my toes to tapping. True to its roots, Chariot’s puzzles are mostly inventory and dialogue based. Combining items is not necessary, and your collection is never extensive. Though many of the solutions are out-of-the-box, they fit into the storyline and the tone of this game. You will not find any mazes, sound or color dependent puzzles, or sliders. One mini-game, Whack Da Ratz, is available if you’re feeling aggressive, but is not required to progress. Twice, there is a short sequence of events which must be completed within a generous time limit. You might have to repeat that series a few times while you figure out exactly what you need to do, but then it is easily done. Chariots is entirely mouse controlled and is played from the third person viewpoint. Its interface is intuitive and easy to use. The left mouse button gets most of the action. You use it to move Sam (the only controllable character). One click causes him to saunter, while a double click prods him into a loping run. While it’s great that Sam can run, one of my scant complaints about this game is that it only worked sporadically. Left clicking also controls the inventory, which is stored in the tatty cardboard box in the bottom left corner of the screen. A click spills the contents of the box. Simply drag the item to the area you want to use it on. Right clicking bypasses dialogue and cut scenes. It also closes menus and returns inventory to the box. Speaking of menus, they are accessed via the little gear icon on the top left of the screen. Here you’ll find save, load, options, new game, and quit. A tutorial is available from the ‘new game’ screen. Saves are at will and unlimited. Each save is marked with a good-sized picture and the date and time. It would be perfect if it included the option to name the saves. In addition, the game autosaves after major milestones. The options menu allows you to customize your gaming experience. Graphics, sound, subtitles, and pop-up text (item descriptions) can all be changed here. My favorite feature is the hint option. In the past, Max’s remarks have added to the atmosphere and general feeling of mayhem. 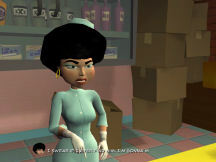 But Season Two gives the player the option to have Max provide hints. You decide if you want them frequently or almost never. I played with the hint level at its highest setting. At this level, Max gave me a nudge here or a push there anytime I wandered around for too long. Not everything he said was useful (this is Max after all), but I learned to pay attention to the little fellow when stuck. Chariots is Alt+Tab friendly and you cannot die. The game was stable. Aside from the aforementioned problem getting Sam to run each time I double clicked, I encountered no other glitches or problems. Chariots of the Dogs may well be the best offering so far in this successful series. I love the new characters (including past and future versions of Sam and Max). The repartee, as always, is snappy and entertaining. The voice acting is wonderful and the music is peppy and upbeat. This episode’s story is my favorite because we learn about the characters’ backgrounds. The hint system is undeniably a hit with me. I finished this one on my own, thanks to some timely words from Max. I even liked the length -- long enough to become immersed in, but short enough to finish in a few gaming sessions. Of course, listing the developers’ pets in the credits won a huge smile from me. Give this one a try, folks! If you are a Sam & Max fan, you’ll not be disappointed. If you are new to this flippant franchise, dive right in. Inventory and dialogue puzzles appropriate to the tone of the game. Sam & Max 204: Chariots of the Dogs is available via download at Telltale Games and on GameTap.